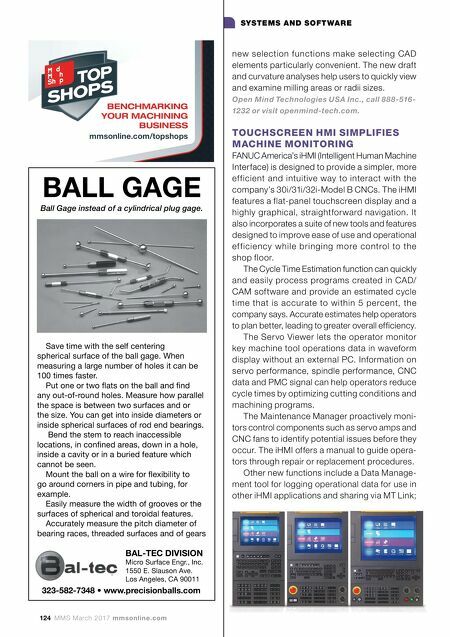 mmsonline.com March 2017 MMS 125 SYSTEMS AND SOFTWARE a Tool Manager for maintaining data on tool usage and life expectancy; an intuitive and simplified CNC operation screen; conversational program- ming; machining simulation; and more. FANUC America Corp., call 888-326-8287 or visit fanucamerica.com. TOUCHSCREEN INTERFACE EASES MULTI-DNC CONTROL, MACHINE MONITORING Spectrum CNC Technologies offers SmartTouch, an intelligent machine interfaces that offers touch- screen access to Multi-DNC files and serves as a feedback loop for job status information. Oper- ators can report parts counts, downtime reasons and more. Customizable buttons are said to make feedback fast and easy. 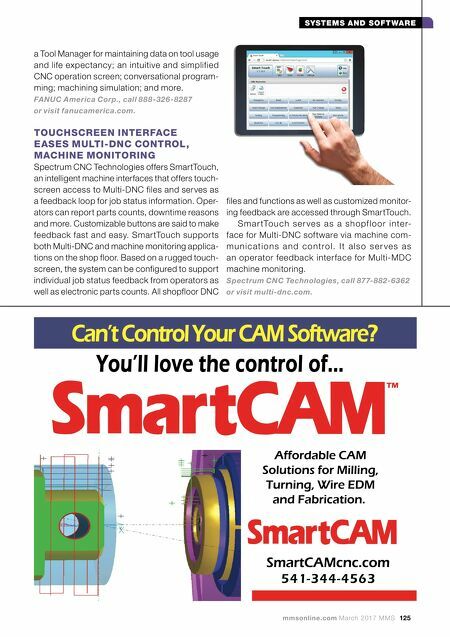 SmartTouch supports both Multi-DNC and machine monitoring applica- tions on the shop floor. Based on a rugged touch- screen, the system can be configured to support individual job status feedback from operators as well as electronic parts counts. All shopfloor DNC files and functions as well as customized monitor- ing feedback are accessed through SmartTouch. S m a r tTo u c h s e r ve s a s a s h o pf l o o r i nte r- face for Multi-DNC software via machine com- m u n i c a t i o n s a n d c o n t r o l. I t a l s o s e r v e s a s an operator feedback inter face for Multi-MDC machine monitoring. Spectrum CNC Technologies, call 877-882-6362 or visit multi-dnc.com.